What Is “Empty Nose Syndrome”? | Larson Law Firm P.C. As we know, all medical procedures and surgeries come with risks. Before undergoing any procedure, our doctors are required to discuss those risks with us, as well as disclose any possible life-altering side effects. When they fail to do so, patients can suffer serious and permanent injury. Empty nose syndrome, or ENS, is a condition that can occur as a complication of nasal surgery. ENS is controversial among doctors: some call it a medical mystery, researchers are unsure why it affects some people and not others, and the medical community doesn’t formally recognize it as a condition. While some doctors are making headway in recognizing and easing its symptoms, some are completely unaware of ENS at all. 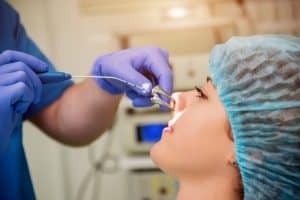 People who suffer from ENS typically develop it after surgery for a deviated septum or similar issue. Often, people with deviated septums have enlarged turbinates (soft tissues in the walls of the nose), which can block airflow through the nose and nasal cavity and affect the ability to breathe. Turbinate reduction is usually part of deviated septum correction surgery, and the majority of patients make full recoveries. However, some people report worsened breathing after surgery. These physical symptoms can in turn cause psychological symptoms like depression, anxiety, sleep disorders, and difficulty concentrating. What causes empty nose syndrome? Researchers aren’t exactly sure why ENS affects some people who’ve had nasal/turbinate surgery and not others. One theory is that the nose’s pressure or temperature receptors are located in the turbinates. Surgery may disrupt those receptors, causing some people to lose the ability to sense their own breathing. Nasal surgery can also remove too much mucus, causing harmful bacteria to colonize in the nose and worsen symptoms of ENS. When you undergo surgery or any medical procedure, you have the right to be informed of any known potential risks or side effects. You have the right to make informed decisions about your health. If you believe you’ve been injured due to the negligent decision of a doctor, the medical malpractice lawyers at the Larson Law Firm, P.C. want to hear your story. We protect the people of North Dakota from dangerous doctors. Call us today at 701-484-HURT or complete our contact form to schedule a consultation at our office in Minot.